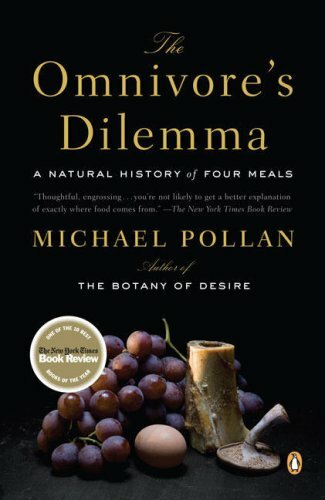 This month, my church’s book club is reading The Omnivore’s Dilemma by Michael Pollan. Because I’ve already reviewed the audiobook, I’m going to keep my remarks here short. Since Pollan’s book was first published in 2006, public attention to the issues he discusses has only increased. Pollan takes a good, hard look at where our food comes from, and he makes us do the same. This information has led many, including me, to change our eating habits. I now focus much more on eating whole foods, local when possible. Although my eating habits aren’t perfect, they have changed for the better since reading this book. Since reading The Omnivore’s Dilemma, I’ve continued to learn about this topic through books, blogs, and documentaries, but none of what I’ve read and viewed matches this book. 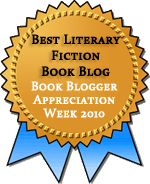 Unlike Barbara Kingsolver in Animal, Vegetable, Miracle, Pollan doesn’t get preachy, nor does he condemn people who make different choices from his own. His goal seems merely to help people make informed choices, not to tell people which choices to make. He does express preferences and discuss his own convictions, but rarely did I get the sense that he was saying that because he feels this way, so must we. This attitude is especially notable in the section on industrial organic, where the issues are complicated indeed. If you’re at all curious about where your food comes from (and to be honest, this is something I believe you should be curious about), Pollan’s book is an excellent, eye-opening read. Highly recommended. I would recommend two other books along similar lines, although they focus more on how we got to our current state food/eating-wise: Charles Wrangham’s CATCHING FIRE: HOW COOKING MADE US HUMAN, who sees a direct line from humans learning to use fire to every other aspect of life that separates us from other apes, and Spencer Wells’s PANDORA’S SEED: THE UNSEEN COSTS OF CIVILIZATION, which demonstrates that by moving from hunter/gatherers to planters/farmers, humans set the stage for what is now a rather dysfunctional system of food cultivation, preparation, and purchase. Thanks for those suggestions! Pollan spends some time in this book on how agriculturalism has affected the way humans have evolved. It was pretty interesting to think about. I did like Pollan’s tone in this one. It reminded me a bit of Richard Watson’s in The Philosopher’s Diet, a 1999 book. I don’t think I’ve heard of that one–another possibility to investigate! I loved his visit to the organic farm. I wanted to give him a standing ovation when that section of the book was done. It’s a good one–lots of great information. I’ve had my eye on this for a while, now. Glad to hear he isn’t preachy about it. I might have to check out the audio – off to find your review of that version. I liked the audio a lot. I didn’t think I took in any more by reading it in print. I thought this book was a little more dense and a little harder to read that Kingsolver’s book, but ultimately this one was more helpful to me since it felt like the suggestions were changes I could actually make. There’s no way I’m going to be able to move to the country and farm all my own food like they did. I agree with you there. Kingsolver was a easier read but ultimately frustrating because I couldn’t do the same (and she seemed to brook no excuses, which made it worse). I read Pollan’s In Defense of Food a few months ago, and interestingly enough found it quite preachy compared to Kingsolver’s Animal, Vegetable, Miracle, which I loved. That is interesting! He definitely gives more direct advice In Defense of Food than he does in this book, which is closer to investigative journalism. I did find IDofF more helpful than A,V,M, though, because I could do what he said to do. But I can see how he might seem preachy in that book. I really need to start being more mindfull of what I am eating. I think I should probably pick this book up! It will certainly make you think before you eat!